A low budget, entertaining, fast-paced and tongue-and-cheek horror/sci-fi film. A film that has much to say to us. A car then drives down an empty highway and comes to a stop near a lamp post. The driver possessing a long surgical scar on his forehead exits the vehicle. We are given point of view shots of his destination as he walks with a blank expression on his face towards a building which turns out to be a casino. 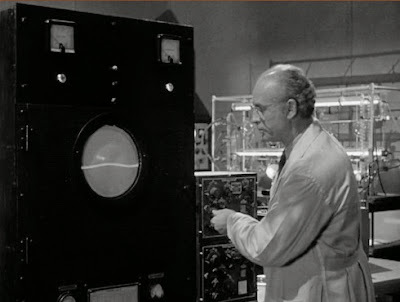 The man, Willard Pearce is being monitored remotely in a lab. In the casino, a cashier hands his boss, Jim Hennessey a case containing $20,000. Hennessey places the cash into the wall safe. Pearce smashes through a window and enters Hennessey’s office. He tells Hennessey, "I told you I'd come back….Remember Buchanan?....I promised to see you die and I will!” Hennessey then fires three bullets into Pearce but with no effect. Pearce picks Hennessey up and breaks his back, the full horror of which is suggested via shadow-play on the wall. Pearce grabs the cash from the safe and exits as two casino employees enter the office and fire at him. 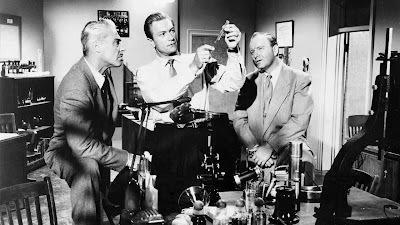 At the lab, gangster Frank Buchanan directs Pearce to return. Ex-Nazi scientist, Dr Wilhelm Steigg takes the microphone and directs Pearce to get into the car. Steigg explains that Pearce will automatically return to his source of feeding when his energy runs low. Steigg and Buchanan put on radiation suits and crawl through a tunnel into the main lab where we see two men with surgical scars on their heads sitting hooked up to IV lines. Here we have an instance of technology not of itself being inherently good or evil. Instead, it is the use to which the technology is put that determines how it is to be assessed. Forensic science at the time was becoming an established method of criminal investigation employed by the FBI and law enforcement agencies. The kind of impact such technologies were having then is akin to the kind of impact that the use of DNA technology is having on 21st Century criminal investigations and their depiction in films. 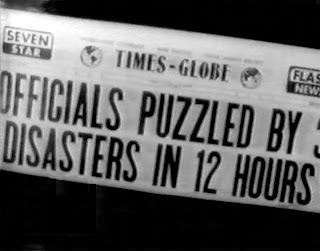 Unlike depictions of the restriction of press freedom to report the truth in many films at the time and the practice of authorities since then to suppress certain kinds of information, the biggest scoop in history is at first virtually ignored by virtue of its being so unbelievable! Later on at Walker’s place, Dave reveals that there was a match on the fingerprints. Astonishingly, they match a dead man's prints. 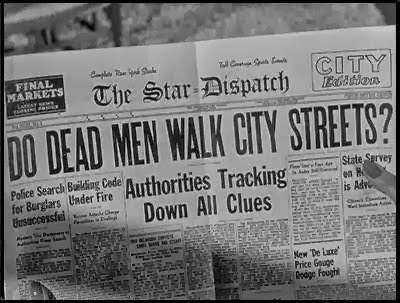 It turns out that according to the “Bureau,” the dead man is Willard Pearce, who was tubercular, had died from asphyxiation and had been dead for 24 days! When informed of this latest crime, Chet and Dave go to MacGraw’s place. The coroner is able to determine the cause of death, but cannot explain how a human grip could cause such severe injuries. After examining MacGraw's car with a Geiger counter. Chet instructs Dave to call the inspector to meet with him and to “ask him to have the Mayor and the commanding General of this military area” in attendance since “we're going to need all the cooperation we can get on this one." 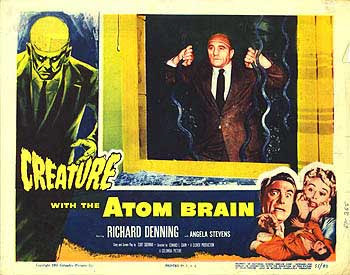 A KXIW-TV television broadcast announces a “fantastic story” involving crimes being perpetrated by dead men who are charged with atom rays making them “impervious to bullets.” After watching this broadcast, Steigg and Buchanan conclude that Chet Walker knows too much about their diabolical plans and therefore must be eliminated. Chet, Dave, Mayor Bremer and General Saunders gather at the office of Chief of Police Camden. Taking a leaf from Mary Shelley’s Frankenstein, Chet uses the Faraday experiment involving the use of electricity on a frog's leg as a way of illustrating the principle of using radioactivity to animate dead tissue. Chet stresses the need to find the source of radioactive emanations by using planes and the resources of the military. Once a story of this nature falls into the hands of the tabloid press, rational, considered and well-informed thought is soon replaced by superficial, sensationalist, and minimalist ranting that plays on and fuel people’s emotions, especially their fears. Pick up a tabloid today (say, from the latter half of 2014, for instance) and feast your eyes on the visual, graphic and textual manipulative muck that purports to be news…..
Three men are later brought in to police headquarters for their own protection: Lester Banning, previously assistant D.A. on the Buchanan case and currently a lawyer in private practice; Jason Franchot, Buchanan's accountant; Tom Dunn, Buchanan's gunsel, slang euphemism for a hired gun or "paid killer." The three men refuse to be incarcerated for their own protection, but they reluctantly agree to around the clock police protection. Later on a creature disguised as a policeman arrives to relieve the officer protecting Franchot. 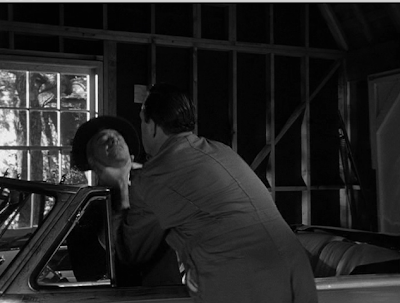 He kills both Franchot and the officer he was supposed to relieve. One down, two to go. 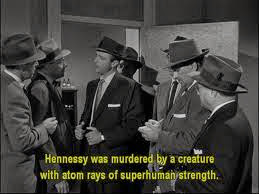 KXIW-TV television news presenter announces: "...with the murder of Jason Franchot last night I must apologize for my recent scepticism regarding these radioactive creatures. 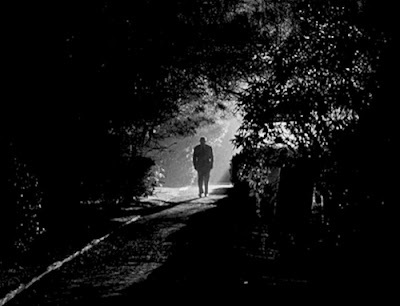 It seems they do exist and are prowling the streets." While the military use their vehicles and aircraft to locate the source of the radioactivity, Dr. Steigg notices a search vehicle outside the bar at which he is having a beer. He hurriedly pays for the beer leaving a $10 bill in his haste to avoid detection. A sergeant carrying a Geiger counter enters the bar and obtains strong readings on both the glass of beer and the sawbuck. The amygdala is an almond shaped mass of nuclei located deep within the temporal lobe of the brain. It is involved in the processing of emotions such as fear, anger and pleasure, as well as helping to determine what memories are stored and where they are stored in the brain. 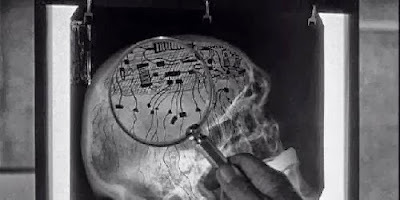 It is astounding how much scientific inquiry is devoted to better understanding how the human mind and body works which serves to do so much to improve the human condition but which also provides potential tools with which to control, manipulate and enslave people. 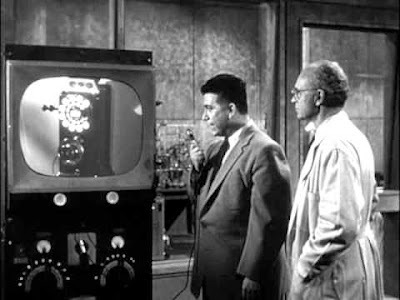 Back at the lab, Buchanan directs one of the creatures to contact Chief Camden and tell him to withdraw all trucks and planes or many people will be killed. They have one hour – by 3 o’clock – to comply. The authorities refuse to comply with the ultimatum resulting in a series of violent and destructive acts. PLANE, BUS, RAIL CRASHES STIR PUBLIC! Such a depiction sits uncomfortably close to our modern-day scenario (as if history has not provided enough examples!) involving the perceived threat from certain overseas and domestic extremist groups. In such cases we seem to be confronted with a group of almost mindless brainwashed thugs being manipulated into committing atrocious acts of violence against innocent people. They appear to be manipulated by those who have perverted the true purpose and direction of that which underpins and motivates their actions. They seem to have been seduced and directed by those who have become adept at using technology to spread their world view of fear and hatred. Unfortunately such messages resonate with a minority of the intellectually and morally deceased of our world. In addition to the violence and destruction caused by such extremist organisations, we now have in response whole nations succumbing to fear, panic and paranoia. Those on all sides are indeed turning into different creatures seemingly intent on creating hell on Earth. 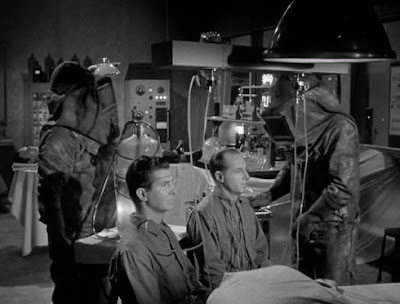 Meanwhile, Franchot has himself been turned into a creature and is disguised as a military officer to be used to kill Chet. Instead, he winds up killing Dave who is then taken to the laboratory for surgery. Dave, now a mindless zombie visits Chet Walker’s place. Chet has already left for the office, but Dave sits with Penny in the living room looking and acting creepy which surprisingly goes unnoticed. Dave leaves after receiving information from Joyce concerning the two remaining men under protective custody. Their likely fate is indicated by the crushed and dismembered remains of the doll. Poor Henrietta will no doubt reincarnate into “Annabelle” some 60 years later! At the county jail Dave kills Banning and Dunn and soon after drives away with Chet who has jumped into the front seat of the car. 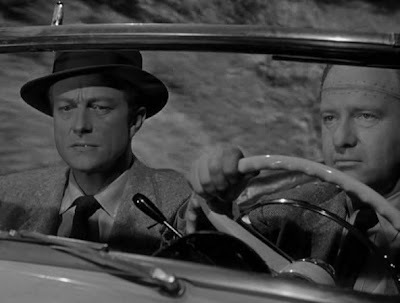 Dave is directed by Buchanan to crash the car in order to eliminate Chet, but Chet jumps out in time. After Dave's body is brought to the hospital for examination, he escapes, steals a police car, and makes his way back to the lab and his radioactive power source. As the police and military surround the lab, Steigg panics and is killed by Buchanan who then directs the remaining creatures to combat the police and military personnel. Dave meanwhile attempts to enter the lab through a window. Chet suddenly enters first and grapples with Buchanan. Dave then enters the lab and kills Buchanan. Chet sets about destroying the lab which deactivates the creatures. 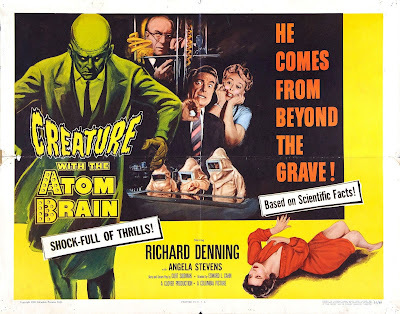 "CREATURES WITH ATOM BRAINS DESTROYED." 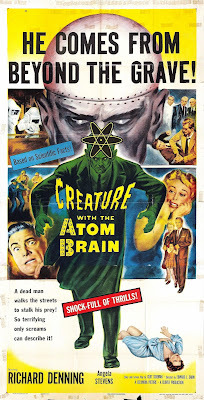 In the film Creature with the Atom Brain, we have the concept of "remote-controlled creatures, their brains powered by atomic energy, roaming the streets, directed from a central point," making the title a very aptly named one. We need to keep in mind that in the mid ‘50s notions of radioactive isotopes and atomic power were a source of fascination and fear. 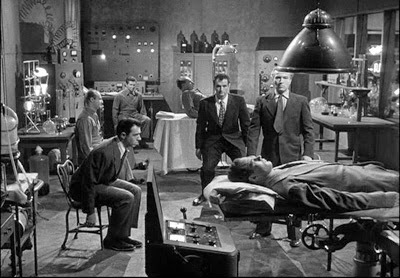 Exploiting such fears and adapting the Frankenstein story with an attempt to resurrect the dead using atomic energy and mid-20th century electronic technology serves to make this a very effective sci-fi / horror film. The film is also very funny (intentionally and unintentionally) especially for modern audiences considering how attitudes have evolved concerning the way in which gender roles and relationships are presented on film and elsewhere. 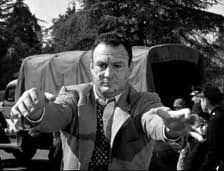 Contrasted with the horror and chaos happening “out there” Chet gets to occasionally seek the sanctuary of his apple pie white-picket fence 1950's domestic bliss complete with a pre-women's lib beautiful blonde wife and a cute but annoying kid. 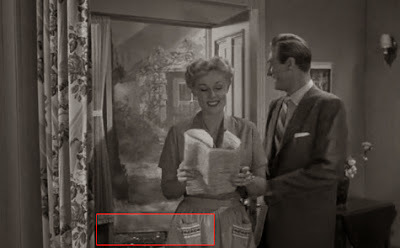 Some might well chuckle when Chet declares, "my wife only talks when I'm ready for bed" and when he arrives home only to be presented with a perfect target of his wife’s backside as she is bent over the doorstep. C’mon, what else was Chet supposed to do?! 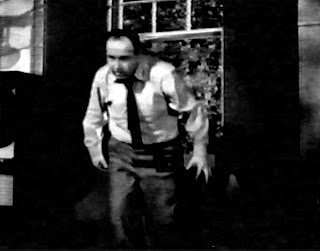 The climactic scene involving the battle between the zombie army and the police / military personnel reminds us of later horror films such as the "Night of the Living Dead." In this case, unlike most of the film, the action switches to extreme close-ups of the zombie combatants making the audience feel like they are in amongst the action. I recently watched an episode from the excellent sci-fi series, Torchwood which featured the use of alien technology in the form of contact lenses that allow remote viewing and monitoring via a computer screen of whomever and whatever is being looked at by the wearer of the lenses. 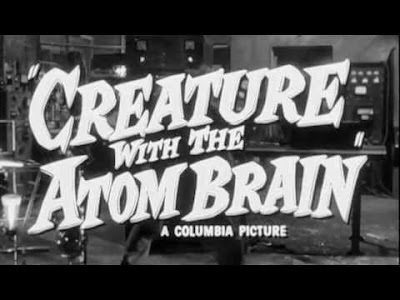 Rewind sixty years and what do we have in Creature with the Atom Brain? The idea of using a TV screen to receive and view images from the zombie creatures’ eyes! It seems that history teaches us that much of what we do, think and see these days is little more than a variation on an old theme……..